Are you the avid photographer in your family? Perhaps you enjoy capturing your family outings together or simply taking your kids’ pictures candidly on a trip to the park or during a relaxing weekend at home. Using our smart phones, we can easily capture all of these treasured moments from weddings and birthdays to holidays and reunions. Instead of storing these irreplaceable memories away digitally, why not showcase them in one place for all to see. Create custom coffee table book and bring your fondest remembrances to life. Our coffee table photo album is perfect for display in your living room so that it can be shared with loved ones anytime. We offer many customizable options that will allow you to design your own coffee table book to your specifications, no matter the occasion. For a complete look at all of our options, our custom photo book page has it all. Once you have decided on a theme for your coffee table book and have gathered all your photos, you are ready to begin building you new personalized memory album. With just a few simple steps, you can create great coffee table books that celebrate your fondest memories. Making coffee table books with Mailpix is both easy and fun! Once you have collected your photos, simply upload them into your Mailpix account’s photo folder. You can easily upload them directly from your computer’s photo library or scan your old photographs. After uploading your pictures, select the book you want to create by choosing the size and cover style that suits you best. Then, select the background style appropriate for your book’s theme. We offer a wide range of page backgrounds, including holiday, new baby, wedding and graduation to name a few. Continue your custom coffee table book by creating your own photo and text layouts for each page. Then drag and drop your photos from your photo folder onto each layout. Finally, review your book when you have finished and place it in the cart. Enter your billing and shipping information and then place your order. After receiving your coffee table book, display it in your living room for all to enjoy and relive your most cherished memories, year after year. With our variety of custom options, you can create a personalized memory album of any theme that is the perfect work of art. With our fully customized options, you can build the best coffee table book of all time, complete with all your beloved memories. Choose a stylish cover and display your best pictures and personalized text for page after page of entertainment. From vacations to birthdays, there are so many great reasons for creating a custom coffee table photo book, no matter the occasion. Perhaps you have some vacation photos stored away that you want to share with family and friends. Upload them to Mailpix and create the best coffee table book travel themed album that displays your most beloved vacation memories. Fill each page with photos of your journey to the beach or a day trip to the mountains and reminisce with your family about your fun, getaway adventures. Our custom coffee table book can be built with a stunning cover and exquisite backgrounds to bring your amazing vacation photos to life. Every couple cherishes their wedding photos. In addition to framing them, why not create a stylish coffee table book to display in your family area for all to see. Design your own wedding album using our lay flat coffee table book that is sure to impress. Our 11x14 lay flat photo book is perfect for any coffee table décor ensemble and will beautifully show off your best pictures from your special day. With our convenient project builder, you can select from our many wedding themed background templates and add your own text for a coffee table book that simply can’t be beat. Whether it’s a wedding album or a vacation picture book, our custom personalized coffee table books are a great way to stroll down memory lane with your loved ones. Create a coffee table book for any occasion including holidays, new baby, anniversaries, graduation and much, much more. Are you searching for the perfect gift? Maybe Mom has a birthday next month or you are planning on visiting your best friend during the holidays and need a stunning gift that is both personal and unique. Look no further than our custom photo coffee table books. Select a book style perfect for your loved one and fill it with page after page of beloved memories. With our various customizable options you can’t go wrong. For even more custom inspirations, our photo gift collection includes a wide range of items that are perfect for anyone on your shopping list. For Mom’s upcoming birthday, create for her a coffee table book, brimming with her favorite photos. Upload your recent digital images and scan your old photographs for a memory album that includes years-worth of valuable remembrances. Our photo cover book would make the perfect birthday gift that Mom can display on her living room coffee table. A personalized coffee table also makes a great holiday gift for your best friend. Check out our lay-flat photo cover book and fill it up with your friend’s most cherished photos. Add photos from a favorite road trip you took together or pictures from your Sunday shopping outing. A lay-flat photo book is perfect for the coffee table since its lay-flat pages make it easy to flip through each page without effort. Both stylish and heartwarming, a lay flat coffee table book is sure to brighten her day. Our coffee table photo books come in a variety of sizes and cover styles that are perfect for any occasion. 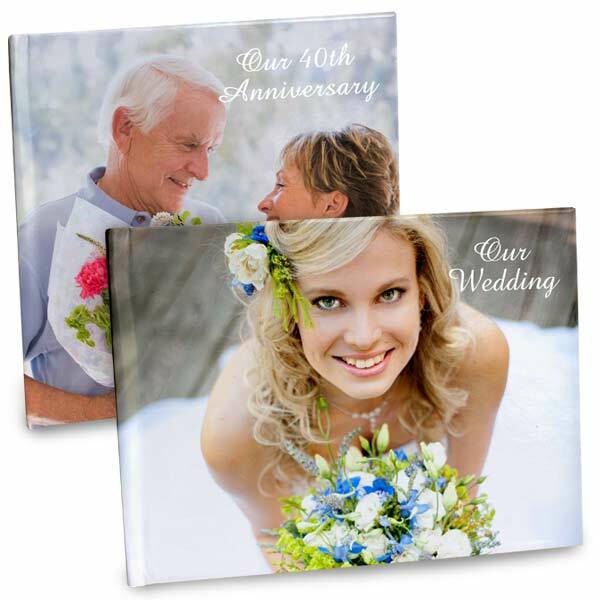 For a splash of color and character, our photo cover books will stylishly display a favorite photo both front and back. Available in 4 different sizes, they are perfect look great on your coffee table and will proudly showcase your favorite memories. Whether you are adding to your current photo collection or you are searching for the ultimate gift, our coffee table photo albums are perfect for any occasion. Design a coffee table book using your own photos and text and choose from our many themed background styles that are sure to compliment your book to a “T”. Our photo cover books couldn’t be easier to build using our convenient project builder. Simply upload your photos to your Mailpix photo folder and begin creating your photo layouts, page by page. Once you receive your new coffee table book in the mail, you can display it proudly in your family room or favorite living area and regale your friends and family with your best memories, year after year.